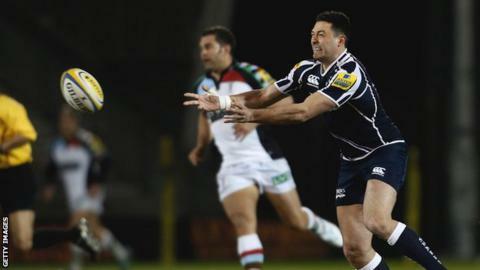 Sale are convinced they will avoid relegation from the Premiership this season, according to former Australia full-back Cameron Shepherd. The Sharks have been at the foot of the table for most of the season. "It's one of those things that's spoken about. You can't ignore the elephant in the room, can you?" the 28-year-old told BBC Radio Manchester. "But not one person in the group - from the physios to Dave Seymour - thinks we're going to get relegated." Shepherd added: "We'll do everything in our power to win every game. We want to work our way up the ladder and we think we've got the ability to do it. "Everyone's positive about it and we want to be up towards the middle [of the table] before the end [of the season]." Despite their recent improvement, which has seen them win three of their last five league matches, Sale are three points adrift of London Welsh at the bottom with six games left to play. If found guilty at a hearing on 5 March, they could be docked points. Shepherd, meanwhile, is hoping to maintain the momentum of his and Sale's return to form since the turn of the year. He was due to join Northampton at the start of the campaign, only for the Saints to because of concerns over his fitness. And while he has acknowledged that it has been a far from ideal start to his Premiership career, he believes he is getting closer to his best form and adapting to Premiership rugby with every game he plays. "It's been a tough transition for me," said Shepherd. "It was a hard start but I feel as though I'm finding some consistency. "I'm enjoying my rugby and I feel I'm getting better with every game. Hopefully I can continue that improvement and finish the season better and better. "It was a frustrating time and I was quite down for the first few months but I feel a lot better now. I'm loving the group and the boys are fantastic."